Definition: When a former or the existing employee of the organization raise his voice against the unethical activities being carried out within the organization is called as whistle blowing and the person who raise his voice is called as a whistle blower. The misconduct can be in the form of fraud, corruption, violation of company rules and policies, all done to impose a threat to public interest. The whistle blowing is done to safeguard the interest of the society and the general public for whom the organization is functioning. The companies should motivate their employees to raise an alarm in case they find any violation of rules and procedures and do intimate about any possible harm to the interest of the organization and the society. Internal Whistle Blowing: An employee informs about the misconduct to his officers or seniors holding positions in the same organization. 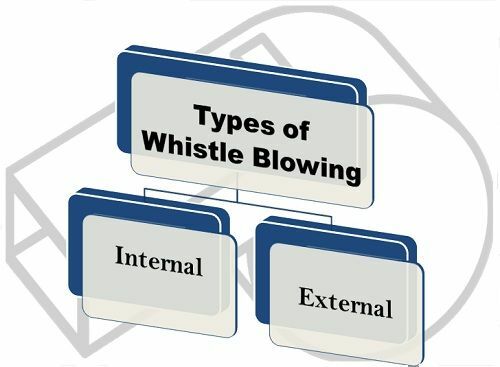 External Whistle Blowing: Here, the employee informs about the misconduct to any third person who is not a member of an organization, such as a lawyer or any other legal body. Thus, in order to provide protection to the whistle blowers, the Whistle Blower Protection Bill is passed in 2011 by Lok Sabha. Note: The personal grievances such as workplace harassment, discrimination, bullying, etc. is not covered under the whistle blowing law unless it is in the public interest.